Believe it or not, radiant floors are one of the oldest forms of heating a structure — dating all the way back to Roman times. Radiant floor heat provides numerous benefits, including increased comfort, even temperatures, cleaner air, no cold drafts, no unsightly ductwork and no floor vents, all while being quieter and more energy-efficient compared to forced-air heat. 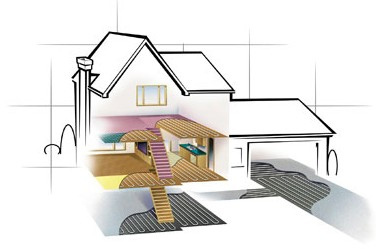 Additionally, a radiant heating system works in zones, allowing different areas of a home to heat at different temperatures. This allows typically chilly rooms, such as bathrooms, basements and entryways, to receive more heat when needed. 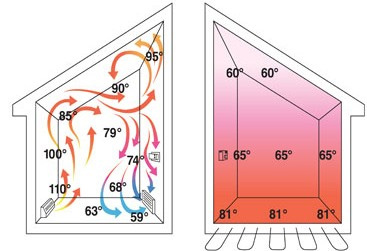 At the same time, rooms with less traffic, such as a den or formal dining room, can be set to a lower thermostat setting, making the system even more energy-efficient. Snow and Ice Melting: The concept of radiant floor heating can also make driveways and walkways clean and dry during the winter, eliminating the need for salting, sanding or shoveling. Snow and ice melt systems help lower maintenance costs, reduce dangerous accidents associated with slippery walkways, extend the life of concrete and asphalt, and eliminate disturbing noise from snow blowers as well as the problem of tracking salt and sand into your home.